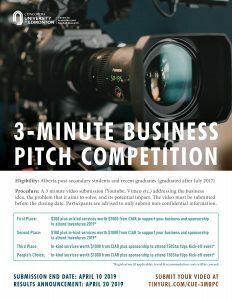 The Concordia University of Edmonton (CUE) Centre for Innovation and Applied Research (CIAR) is pleased to announce its first 3-Minute Business Pitch Competition. The competition follows the spirit of 3 Minute Thesis (3MT) ® competition style that originated at The University of Queensland. This competition is an opportunity for students to showcase their innovative business ideas to a wider audience in the Edmonton region and beyond.